Traveling Toddler | Notes from an often Calm Mother. Whoever said traveling is not about the destination, but the journey, must not have traveled with a child. As mentioned in my previous post, traveling with a child is about plenty of planning and preparation. There will be a myriad of things going through your mind relating to what to pack, which toys she would love best without bringing the whole toy box, what foods are allowed in the country, etc.. Eek! I wish someone would have advised me.. Nevertheless I learnt and I’m sharing! We arrived in Singapore early in the evening. After having only a short nap, Ava was too exhausted to protest about the hour long immigration line. Luckily we had met the older couple queuing behind us, earlier on the plane and they helped me keep Ava entertained. By the time we checked in and got our luggage, we were both ready for bed! But we kept to our routine as we would at home – I gave her a bath, dinner and read a book for story time. I had packed for Ava some organic jar foods, which she blatantly refused (she is a fresh-food bub!) but happily drank her sachet of powder formula. 30 minutes later, after a bit of unease about her surrounds, she dozed to sleep with her comforters. Now it was my turn to tune out! Ahh.. room service. As I had packed light, I visited the supermarket the next day to stock up on supplies for the week. Nappies, fresh milk, cereal, fruit, yoghurt, and I bought familiar brands where possible. A friend had also dropped off the umbrella pram I pre-purchased on eBay for $40. This pram would be my lifesaver for the week, as the city is a walk-everywhere kind of place and carrying a 13kg bub did not appeal! The days passed and we stuck to our routine where possible (naps back at the hotel every midday-2pm and always a bath before bed). At first Ava’s eating was a little less than ideal – she would mostly stick to eating the foods I purchased from the supermarket. Luckily she found a love for dumpling noodle soups and sushi. As for a bit of shopping and sightseeing.. that wasn’t entirely impossible, just a bit of hard work. 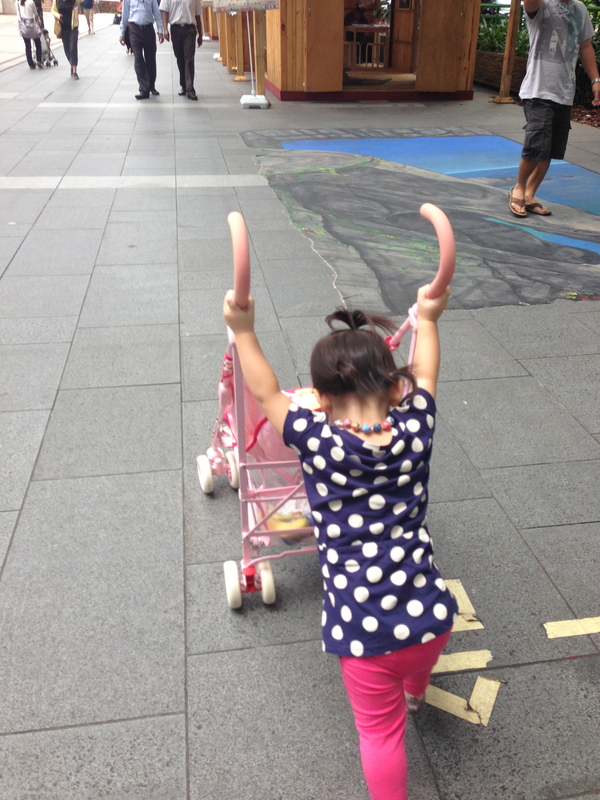 An underslept toddler in a new city resulted in an overtired and hyper-active toddler. Ava was mostly interested in hiding under the clothes racks at the shops and going up and down stairs at the Aquarium and Gardens. Which meant I was constantly playing chase and grab. At least I saved money on barely doing any shopping! All in all it went pretty well. I’m not sure if I would do it all alone again for such a long period, but we got the hang of it. Kids are full of surprises though, as we came home and got straight back to our routine (home time zone), it was like we never went anywhere. – If you are traveling solo or thinking twice about taking your space shuttle of a pram, why not hire/borrow/buy a pram at your destination – this means you can travel light. Ask the hire companies if they can deliver to your hotel. If buying a pram, consider what to do with it afterwards. Give it to friends? Donate to goodwill? We were lucky enough to have had a very helpful porter who just had a grand daughter, and we gave our pram to them. Also invest in one of those backpacks for your child that has a child “leash” to keep your bub with you at all times. Better leashed than lost! – Pack foods that your toddler will eat, but check with the country’s food restrictions first. Dry foods such as cereal is usually okay to bring from home and saves you from paying double the price at the supermarket. Pack sachets of formula, in case the milk is not pasteurised/you have no time to get milk. – Try to get bub used to jar foods, this is a convenient and cost effective meal on the go. – Ensure bub stays well hydrated and is eating fibrous foods. The last thing you need a sick child in a foreign country! – Pack his usual comforters and let him have a dummy when he wants it – he is probably slightly insecure about what’s happening, and this will comfort him. If you usually control dummy use at home, he won’t want it as much anyway. – Keep to a routine where possible. Yes, you are visiting friends/family but they will understand that bub’s needs come first. – Don’t expect things to go smoothly, if it does, great but don’t get upset when it doesn’t. – If you want to go shopping or sightseeing – go! Bub will enjoy seeing new things, but try to keep it short and have coffee breaks. – Greet the porters/concierge at the hotel in friendly manner – they will help you load your things into and out of a taxi quickly, and some may help you, the friendly hotel guest with the cute baby, jump the queue. All the little things that make it easy for you and bub! – It’s easy to neglect ourselves when we’re so busy keeping an eye on bub. But it is so important to look after yourself. At the end of the each day, practice a bit of yoga or do some stretching and breathing excercise. This will help relieve any tension and gets you to sleep better, resulting in an easier morning. – Give your bub the benefit of a doubt – they may be more intuitive than you may think. Once home they revert to their routine as you’d expect. And no doubt is as glad to be home as you and your husband are. The eBay pram doubled as a new toy! Ahh.. HOLIDAY! We all love a holiday but some of us often come home feeling like we need a holiday from the holiday that we just had. Probably because the whole family tagged along.. A holiday used to be about shopping, partying and lazy sightseeing. Now as a mother, a holiday with bub means being an extra busy mum in a foreign country. This automatically translates to getting out of routine, constantly worrying about what food bub will eat and searching for the parents’ room in an alien language. As for shopping and lazy sightseeing? Let’s do that again in 18 years! What about the holiday after the holiday? Yes.. that would be skulling down a hot cup of tea on the kitchen island whilst catching up on mail/sleep/washing/younameit. 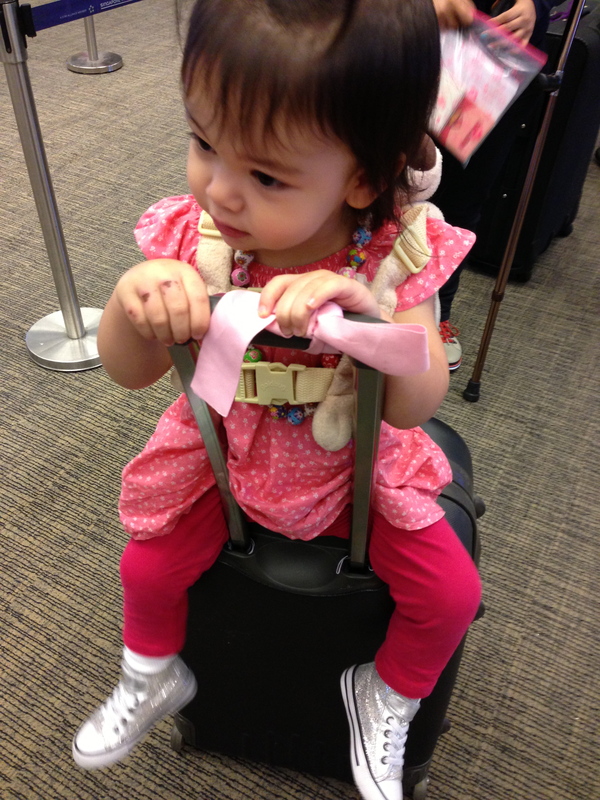 The first time I planned an overseas trip with Ava, I was naturally anxious. I was nervous about the journey, about her meals, and of course the impact the travel would have on our strict routine. Plus I was traveling sans husband (he was already pre-booked for a conference). Ava had been great on short flights and road trips before, but this one was an 8 hour journey! How to keep an 18 month old toddler occupied for so long?? Since we were flower girl and bridesmaid to a friend’s wedding, we had to go and I needed a plan. I’ve heard stories of parents struggling with the whole flying experience and conducing to medicate their toddlers for various reasons. Although I took their advice in stride, I was adamant not to medicate Ava.. I purposely booked the daytime flight as an overnighter would have us leave close to midnight, which means broken sleep for bub, not to mention the re-settling on the plane. Caring for a sleep deprived toddler (and self) would not have been a good way to start the trip. Ava is a 7am-7pm bub so the 9am flight was much better. I boarded the plane armed and ready and had allowed Ava to run around the terminal a little bit. The plan was to tire her on land, then keep her occupied on-board without getting hyper. So, I stocked my one carry-on (a huge LV Neverfull is the best mummy/nappy/travel bag) with fiddly foods such as Rice Wheels and sultanas (recommended ear poppers), water, colouring and her fave reading books, and my old iPhone for games. On the plane, as we discussed where we were going, my worries started to dissipate. Here is my toddler seemingly calmer than myself, pretending to be an airplane and singing “whee whee whee”. On take off, I was pleasantly surprised that the air hostess encouraged Ava to sit in her own seat, rather than be strapped to me. Wow did she feel like a big girl! For the first few hours, she kept herself busy with food, books and the in-flight entertainment. Upon nap time however, she was too distracted to sleep! Mind you the bassinet provided wasn’t long enough for her and other toddlers around us were crying (they probably didn’t have sultanas!) so I couldn’t blame her. She did end up napping on my chest for a good 40 minutes thankfully. I saved the trump card – the iPhone for the last leg of the flight, and it worked wonderfully. She shared it with the toddler next to us (which quietened him down too) and I didn’t have to worry about it running out of battery. Phew.. what nerves? This has become a journey more enjoyable than I expected! – Travel lightly on board by having only one easy access carry-on bag. – Pack fiddly foods that are low in sugar. – You don’t have to be the first on board if you are traveling light. Do you really need an extra 30 minutes of toddler distraction? Let him run around a bit longer! – Introduce toys or activities one at a time. – Let them watch as much in-flight entertainment as they want! – Run up and down the aisles a few times and try to say hello to a couple of flight attendants or other passengers. Your toddler will love saying hi to them when he sees another familiar face on board. – Stay calm. Anxiety is contagious. – Shower bub with praise when he’s good and speak to him in a distractingly happy voice. – Be warned – using the lavatory can be a challenge with the two of you in there. So will changing a nappy! – During lunch, have a sip of wine. You will need it. – At the end of the journey, reflect on the positives and apply that to the return flight home. – Once home, reward yourself with a trip to the day spa and some shopping! Hope that helps all you wonderful parents out there! Traveling with a toddler is a memorable experience and good bonding time. I am hoping to post Part Two of my Guide to Traveling with a Toddler in the next few days. It will cover what happens at the destination!